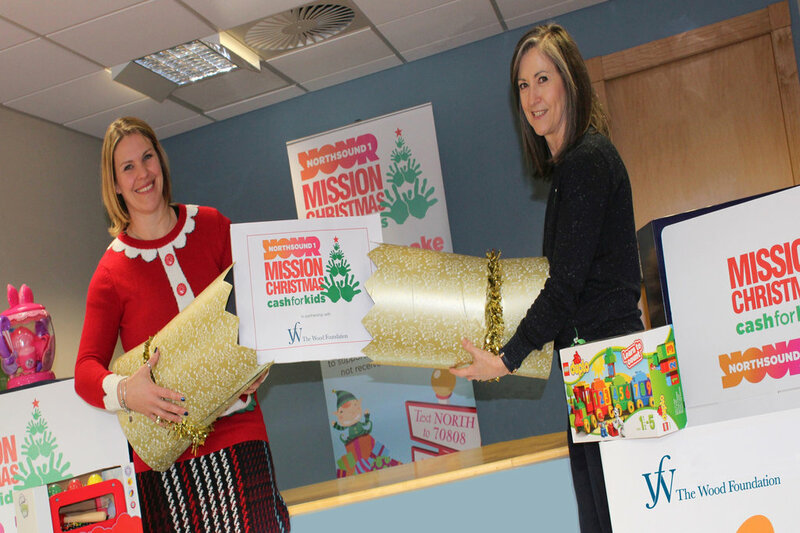 The Wood Foundation is once again supporting the Northsound Cash for Kids Mission Christmas Appeal by contributing £15,000 to cover operational costs, ensuring all donations go to those who most need them in the North East of Scotland. A north-east charity has launched its annual festive gift appeal with the aim of making it a cracker of a Christmas for thousands of local underprivileged children. With less than 30 days until Christmas, Cash for Kids has kick-started a massive campaign to ensure that over 7,000 youngsters in Aberdeen and Aberdeenshire receive a present to open on Christmas Morning. The charity’s Mission Christmas appeal is the largest such appeal in the area, and is once again being organised in partnership with The Wood Foundation, the philanthropic organisation founded by Sir Ian Wood and his immediate family. With an estimated one in five children in Aberdeen and Aberdeenshire living in poverty, Cash for Kids expects that the number of children receiving presents from this year’s appeal will exceed last year’s record of 7,133. Applications to the appeal are made on behalf of children by community groups, health visitors and social workers. So far this year Cash for Kids has already received gift applications for over 5,600 children. With each child being given three items that have a combined approximate value of £50, the scale of the Mission Christmas appeal is clear. Cash for Kids is asking for the public’s help in order to once again make it a Christmas to remember for these youngsters. It is encouraging north-east residents to purchase one extra child’s gift when shopping this Christmas and donate it to the Mission Christmas appeal, or donate money or gift cards. A number of businesses across the region are supporting the appeal by offering customers special deals. Christmas shoppers at Aberdeen’s Bon Accord centre can park for free until Monday, 18 December if they donate one of its gift cards to the appeal with a minimum of £10 on it. Meanwhile DW Sports at the city’s Beach Boulevard Retail Park is offering a 20% discount on items that will be donated for the appeal. Over 200 donation points where people can drop off new, unwrapped gifts have been established at businesses and shops across Aberdeen and Aberdeenshire. This is the greatest number of donation points in the appeal’s history. The final donation day is Monday, 18 December, however Cash for Kids is encouraging the public to donate items prior to this to ensure all gift applications are fulfilled and distributed in time. The scale of the appeal means that it is again being coordinated from a modern warehouse facility in Aberdeen. The building has been donated free of charge by Knight Property Group for the duration of the appeal. Aberdeen-based haulier Colin Lawson Transport is supporting the appeal for the seventh consecutive year. The firm is providing a dedicated driver and vehicle to collect the gifts from the donation points across the north-east. Along with the support of businesses, an army of volunteers will be donating their time over the coming weeks to sort through the donations and allocate them against applications. To help raise additional funds for the Mission Christmas appeal, Cash for Kids is holding its annual Christmas Jumper Day on Friday, 08 December. The charity is encouraging businesses and schools to persuade their staff and pupils to pull on their favourite festive knits and donate money to the appeal. Cash for Kids will use the money to purchase extra gifts if fewer items have been donated for specific age groups. Michelle Ferguson, Cash for Kids charity manager, said: “Mission Christmas is a mammoth operation that people across the north-east really get behind, either by donating items, volunteering in our warehouse or partnering with us. We are proud to once again to have the support of The Wood Foundation for this festive campaign. Sir Ian Wood, chairman of The Wood Foundation, said: “To know that there are children right now, living in the north-east of Scotland who may not experience the excitement of receiving a special gift on Christmas morning is incredibly sad. In Aberdeen city and Aberdeenshire, poverty is often not as apparent as in other parts of Scotland, with the result that it often goes unrecognised and unaddressed. More information on the appeal, including a full list of donation points and information on the Christmas jumper day, can be found at www.northsound1.com/mission.